About the Snowshoe colour pattern. Snowshoe's are a short haired Colour Pointed cat with blue eyes, and generally exhibiting the rare white markings unique to the Snowshoe Breed. It is this white that separates them from any other short hair colour point, and as the white is dictated by a "Random White Spotting Gene" it is notoriously difficult to either predict or control the markings on each kitten. So each Snowshoe kitten is uniquely marked with it's own random pattern. The ideal and highly prized markings known as Preferred Pattern include white socks to the ankle in front, white boots to the hock behind, white 'inverted vee' on the face & white to chin, chest and underbelly. This pattern is particularly difficult to achieve and therefore the perfectly marked Snowshoe cat is both rare and valuable. The majority of Snowshoe cats will have a version of the Preferred Pattern with partial white to the face, or the Mitted or Bicolour markings- all of these are Show quality markings. Some Snowshoes are without any white - these Colour Point cats are suitable to breed from but are not Show quality. 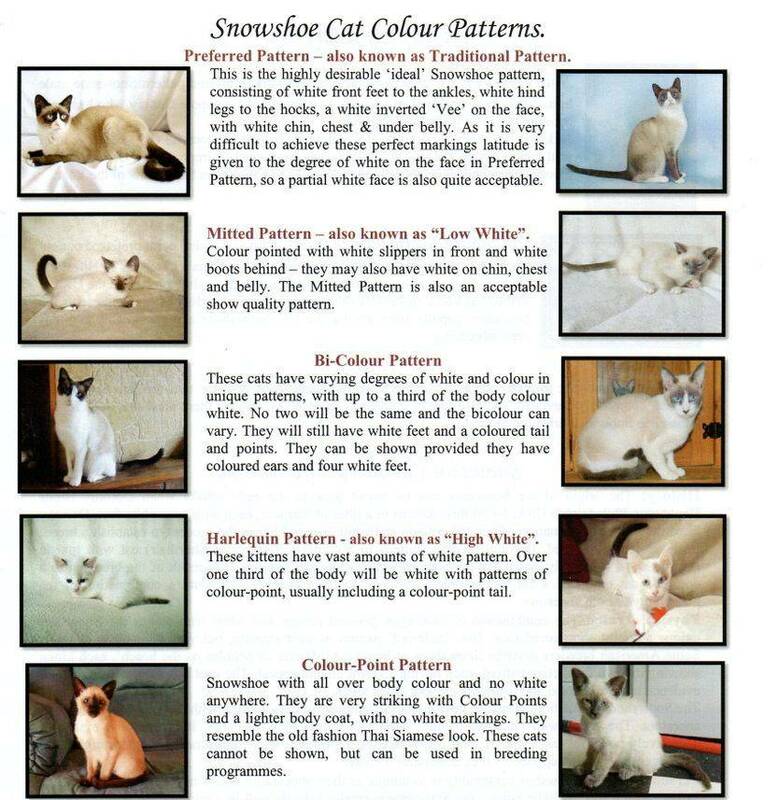 The Point colour of the Snowshoe coat comes in all basic coat colours carried by the Siamese - but Seal Point and Blue Point are by far the most predominant. The Snowshoe kitten is born white, taking several weeks to develop colouring to the points and display any white markings. The creamy body colour will also develop and gradually darken with age. One thing all the different Snowshoe colourings have in common - they all make wonderful and exotic pets regardless of markings! Photo's above courtesy of Destrier Snowshoes UK, Coldenufforsnow Snowshoes UK, & Skiboots Snowshoes Vic.